Lyon, France is located in eastern France at the confluence of the Saone and Rhone Rivers, approximately 240 miles southeast of Paris. The St. Louis-Lyon Sister City affiliation was formed in January 1976 and has been very active ever since. The St. Louis-Lyon Group cosponsors the annual St. Louis-European Student Exchange Program for high school students. The Committee can provide information helpful for establishing business contacts. An undisputed center of scientific and technological excellence, the Lyon metropolitan area is the richest and most dynamic economic capital in France after the Paris area. Chemicals, textiles, mechanics, state-of-the-art technology… the flagship sectors of Lyon’s economy have their roots in a dense industrial history. And each day, companies and their managers demonstrate their ability to innovate in the global marketplace. The chemical and pharmaceutical industries may have had humble beginnings as dyeing workshops, late in the last century, but today their products and materials are in demand across the globe. 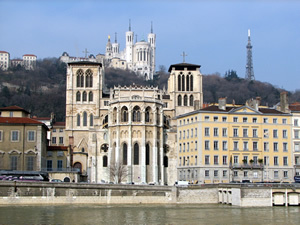 Companies such as Rhône-Poulenc, Mérieux and Boiron make Lyon a European healthcare center of the first rank. The people of Lyon are deeply attached to their city, and quite naturally enjoy sharing its attractions with visiting guests. They love the pleasures of dining and will drag their guests off, a shade mischievously, to the famous bouchons, the cozy restaurants whose family atmosphere encourages endless discussion, fueled by the region’s finest culinary specialties. You will sample the most renowned specialties. Among the main dishes: pork chitterlings, fried tripe in brezad crumbs, pike dumplings, sheep’s feet… On the sweet side: thin beignets, cushion and cocoon chocolates… The wines include delicious vintages from the prestigious vineyards of neighboring Burgundy, the Côtes du Rhône and the Beaujolais. Taste buds at the ready! The city itself is an invitation to stroll and wander. You will amble across squares, along riverbanks, through the Gardens of Fourvière or the sumptuous Tête d’Or Park. You will fall for its delicate hues, the pinks and ochres of the Croix-Rousse and the banks of the Saône, the rivers blues and browns, all made richer and deeper by the night-time illuminations. Feel the city’s pulse throb in the market on the Quai Saint-Antoine, and the Craft Market. In the luxury downtown boutiques, in craftsmen’s workshops in Saint-Jean, and in antique dealers’ shops on the Rue Auguste Comte. WhSaint Louis – Lyon. Please visit us at www.stlouis-lyon.org/.